Because my target audience is within a bracket that I am very much involved with (16+) I can take advantage of my first hand experiences with music that I love, in order to maximise my ability of targeting a specific audience. As musicians within the 21st Century have become so reliant on social media to obtain such an immense fame, I will want to keep social media in forefront of all my ideas. With fan groups that live on sites like Twitter and Tumblr, I can see their loyalty is like no other. With consistent blogging about their favourite artist, dedicating an entire blog to them, reposting their recent music videos and songs and also recasting their videos into new formats such as .GIFS, collages and fanzines (fan magazines). Here is an example of how websites like Tumblr are inspired by fine details within a music video. 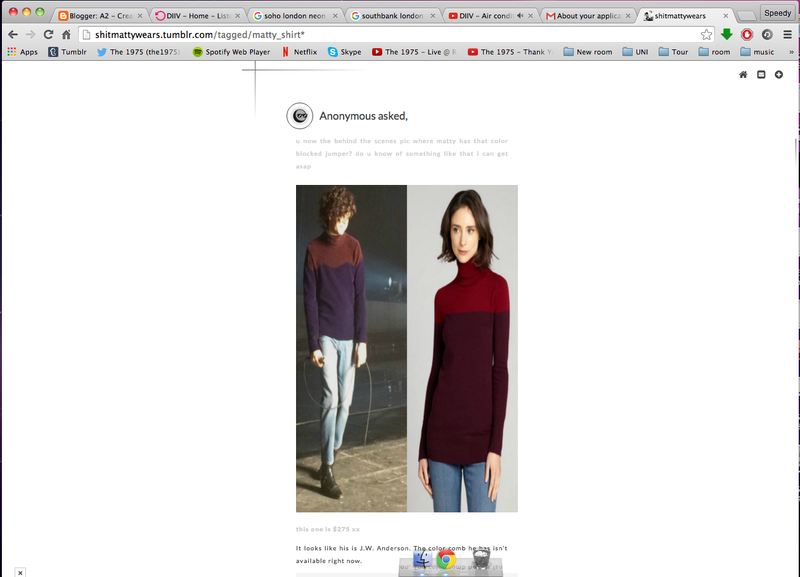 This tumblr is a fanblog for The 1975, they post the things they wear in their recent music videos. This adds a second source of promotion as they constantly repost the same music video. So costume ideas will be really important for my music video as I will know my target audience will want to copy what the actors wear etc.